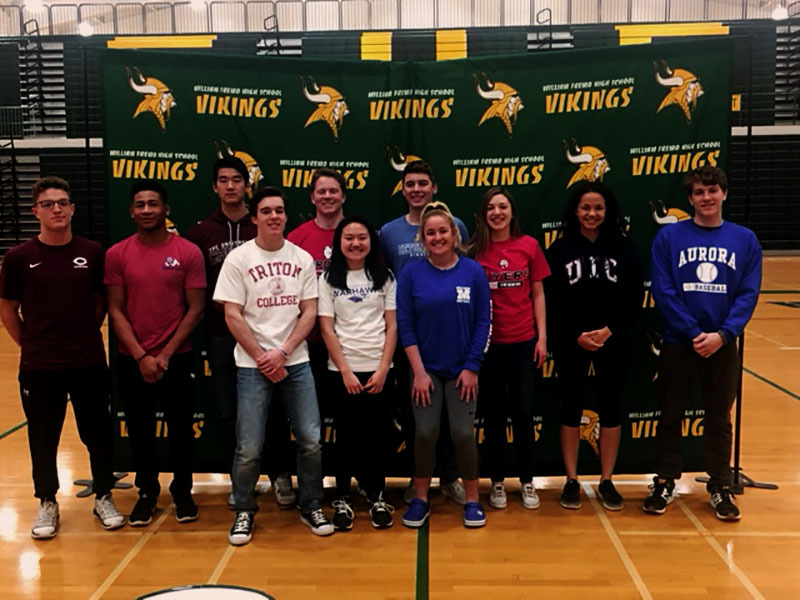 Thirteen William Fremd High School student-athletes signed letters of intent with colleges and organizations around the world during a spring signing day ceremony held in the school’s gymnasium April 11. Wrestler Cole Riemer and Basketball player Ryan Martin both signed with the University of Chicago, while fellow wrestler Adam Kemp will travel west to wrestle for Fresno State. Martin’s teammate Greg Cano will play for Viterbo University in La Crosse, Wisconsin. Also heading north, tennis player Elsie Ha has decided to sign with the University of Wisconsin – Whitewater. Kaylee Goluch will play softball at Millikin University, while Ashton Statz and Luke Seidel will play baseball at Aurora University and Triton College respectively. Vikings Football senior Sean Gorman will play close to home next year as he signed to play at North Central College in Naperville. Swimmer Marie Grzybek will travel a short distance south after signing with Lewis University in Romeoville, while her teammate Rebecca Ballo will be swimming at the University of Illinois – Chicago. Senior diving team member Zach Mega will move to Orange, New Jersey with his signing a letter of intent with Seton Hall University, and Soccer senior Matt Austin will move to Marbella, Spain after signing to play for the Marbella United FC of Spain.